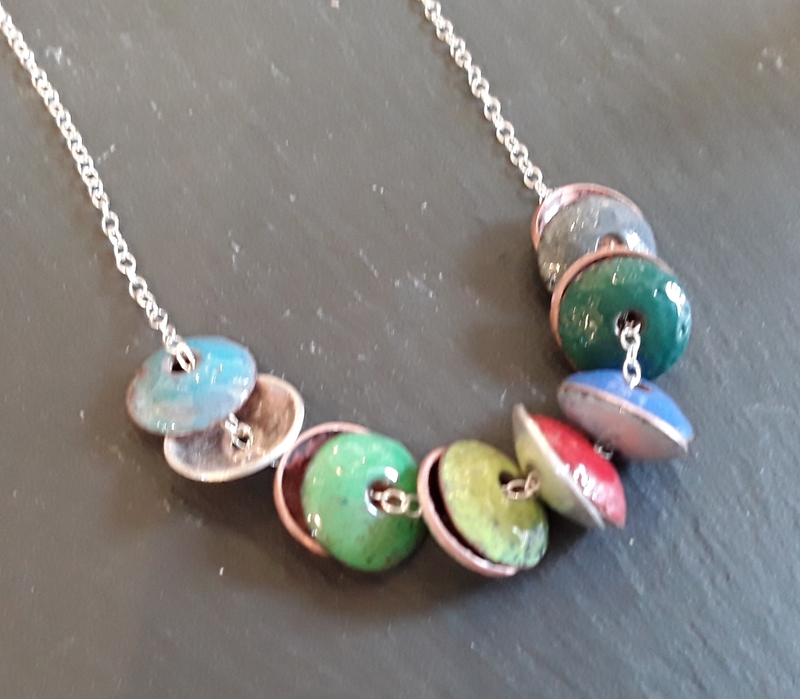 Copper enamel and silver multi coloured abacus necklace. Handmade and unique. 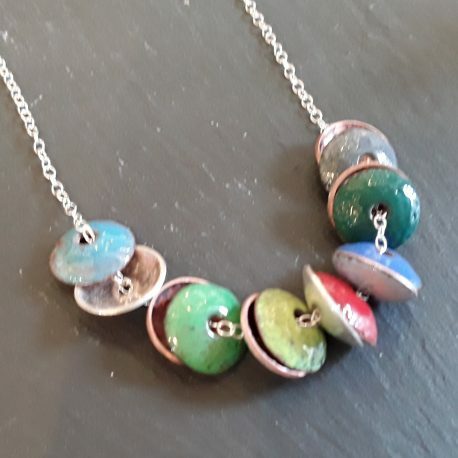 Bright coloured abacus necklace in copper enamel. 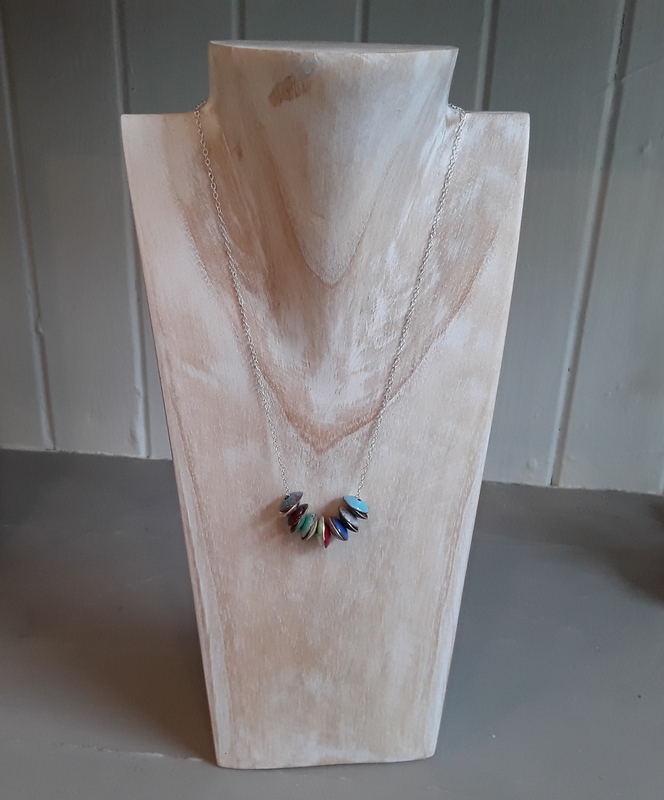 As there are so many colours to choose from within this necklace it will naturally be easy to wear with most of your wardrobe. Kiln fired enamel copper cups and sterling silver cups have been strung on a sterling silver 18″ chain. 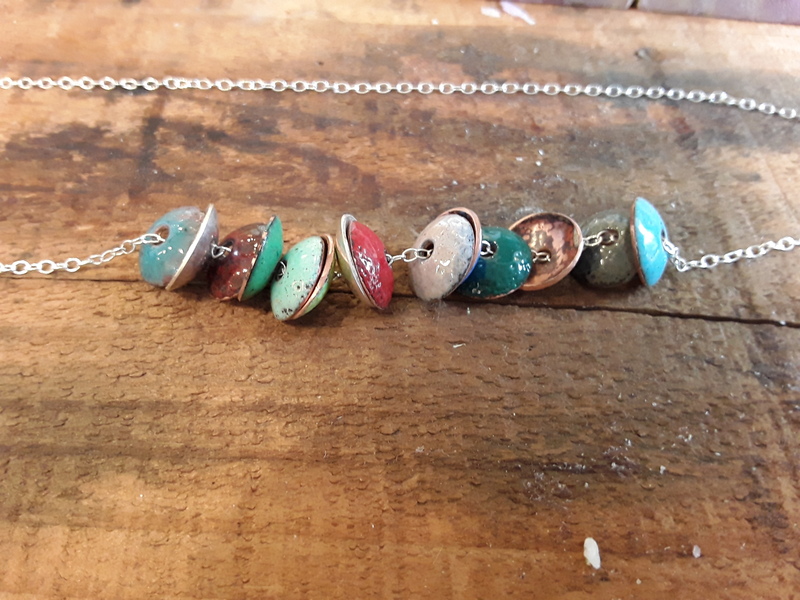 Due to the nature of the process each necklace will always be slightlydifferent from the last in terms of colour combinations. If you have a specific preference on colour combinations I am more than happy to work with you. All of Mycherrypie jewellery is delivered to you gift ready in a copper foiled gift box. 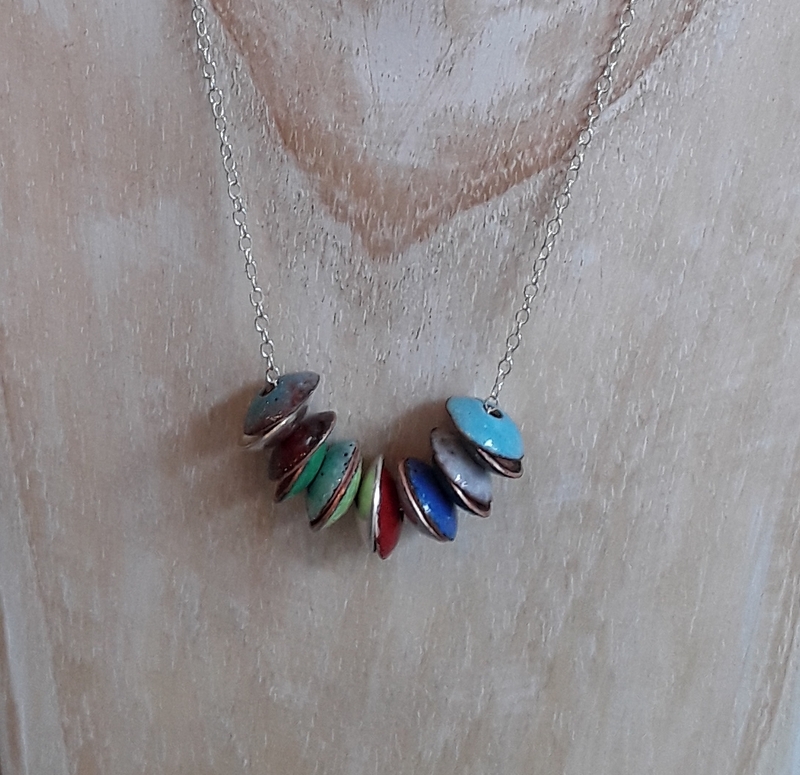 Multi coloured enamel abacus necklace. Original and upbeat contemporary handmade necklace. 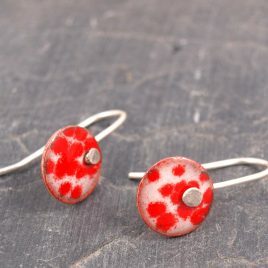 These little round enamel drop earrings have a really unusual and contemporary feel. A bright and modern design. A small copper disc (12mm) has been decorated by kiln firing layers of glass enamel powder which are then fused together to create pattern. Due to the nature of the enamelling process each design is entirely unique and individual. I have then made an ear wire from sterling silver which has been attached through a hole in the copper disc. These round enamel drop earrings have an elegant drop of around 2.5cm The earrings will be delivered to you carefully packaged in a hand stamped cotton linen gift back ready to give. Splat stud earrings. Oxidised copper with a 'splat' of coloured vitreous enamel in the centre. These earrings are available in a range of colours and there is also a matching necklace. The colour in the photograph is dusk blue. 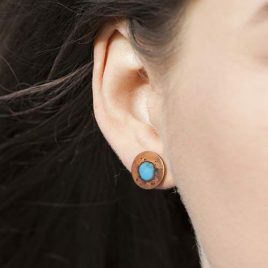 The size of the ear stud is 11mm round. 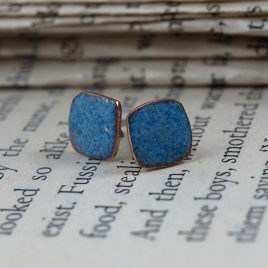 Little mid denim blue ear studs great for everyday wear. A small 8mm square shape has been sawn from sheet copper before being kiln fired with a vitreous glass enamel powder to create a deep colour on the surface of the metal. After firing I have matted the enamel to create a softer stone like appearance. A sterling silver ear post with scroll has been soldered to the back of the earring. All of my jewellery is delivered to you gift ready in a cotton linen gift pouch ready to give. Copper enamel pebble link bracelet. 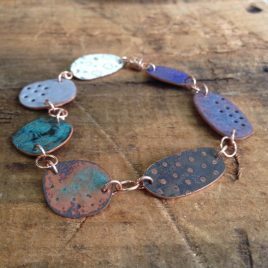 Beautiful rustic coloured copper enamel bracelet with rose gold links and magnetic clasp. A truly individual piece as each copper shape is hand sawn and enamelled seperately with a combination of opaque and transparent colours which are fused together in s high temperature kiln. The length of this bracelet is 19.5cm. All of my jewellery is handmade in Scotland and delivered to you gift ready in a complimentary gift box.